Asphalt surfaces are inherently porous. As a result, they are susceptible to penetration by water and petroleum products like gasoline and oil. Water penetration can be especially damaging because when water freezes it expands, causing cracks and frost heaves in the asphalt surface. Gas and oil stains are also a damaging agent, dissolving the asphalt’s substrate, resulting in erosion and disintegration. A sealcoat provides lasting protection against the damaging effects of water, petroleum, and the extremes of New England weather. Sealcoating improves your property’s resale value and enhances the appearance of your home or office with a slick, airport-grade finish. It is also a cost-effective way to extend the life of your driveways or parking lots surface. For a fraction of the cost of replacing damaged asphalt, you can sealcoat its surface, preventing damage and extending its life considerably! With our application that uses hand squeegee for thicker product, a general rule of thumb for driveways is every 3-4 years but more frequently may be recommended depending on the driveway use and exposure to damaging elements such as oil and gas stains. For commercial property, sealcoating more often is recommended for heavily used parking lots. The price of sealcoating depends on the length and width of the asphalt area and the preparation work required. Cametti Sealcoating will provide a free quote so you won’t be surprised. Are there different sealcoating products? Sealcoat can be made as a tar product, petroleum product, or asphalt product. We use a tar based product with acrylic additives that provides the longest wear and best protection against water and chemicals. Sealcoating is strongest when applied full strength, and not diluted for use with a sprayer. Cametti Sealcoating applies the product using a squeegee for a stronger bond and longer life. A newly seal-coated surface is ready for use between 6 and 24 hours, depending on the application. If needed, we can apply the sealcoating over multiple days for traffic flow, covering half a driveway or only a portion of a parking lot at a time. Can you apply sealcoating in the rain? Sealcoating requires a dry surface. We work around the New England climate changes, with our busiest times on beautiful, sunny days. On the wettest days, you will find us visiting sites to provide free quotes. What months do you sealcoat? Cametti Sealcoating applies sealcoat typically from April to November, while temperatures are 50 degrees or higher. Should I clean my driveway? Cametti Sealcoating will remove debris from the asphalt using a high powered, commercial blower. If there are other cleaning requirements that require more than our blower, we will discuss that with you in advance. Will my grass be damaged from sealcoating? Since we hand apply the sealcoat with a squeegee, we control with accuracy the application, especially near all grass areas, to avoid leaving sealcoat on your lawn. 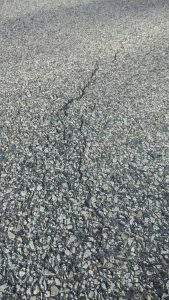 Will you repair broken asphalt? Cametti Sealcoating will repair cracks in asphalt with a filler product prior to sealcoating. Minor asphalt repair is also available. When we come out to provide you a quote, we give you our honest and expert opinion as to whether or not filling cracks and sealcoating is your best approach, or asphalt repair. I have a new driveway. When should I sealcoat? New asphalt should cure for at least 6 months. The first sealcoating should be done between 6 and 8 months after the driveway is built.